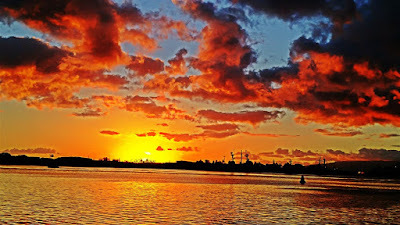 Time to end the week with this sunset into Honolulu Harbor. One of the benefits to living and working so close to the ocean is the ability to look out into the ocean and occasionally see a spectacular sunset like this one. I hope you all have a great weekend. 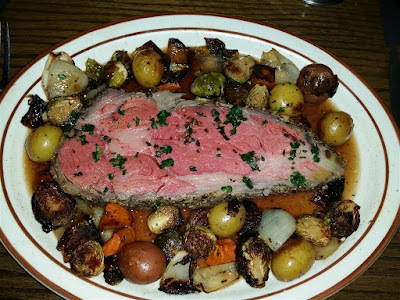 Here is the Smoked Prime Rib plate with roasted autumn vegetables, fingerling potatoes, horseradish cream and Au Ju from Livestock Tavern. Not only does it look awesome but it tastes incredible with that nice smoked flavor. They say this dish tends to sell our most nights. If your in downtown Honolulu be sure to visit Livestock Tavern and give this a try. Time to close out Halloween for another year. 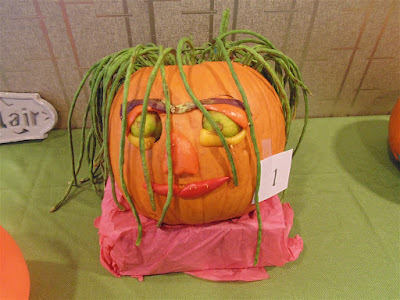 We end with the pumpkin face that was entered into the Pacific Guardian Center’s pumpkin carving contest. I especially like how they did the hair. Maybe next year I’ll try to come up with something. I haven’t carved a pumpkin in years.